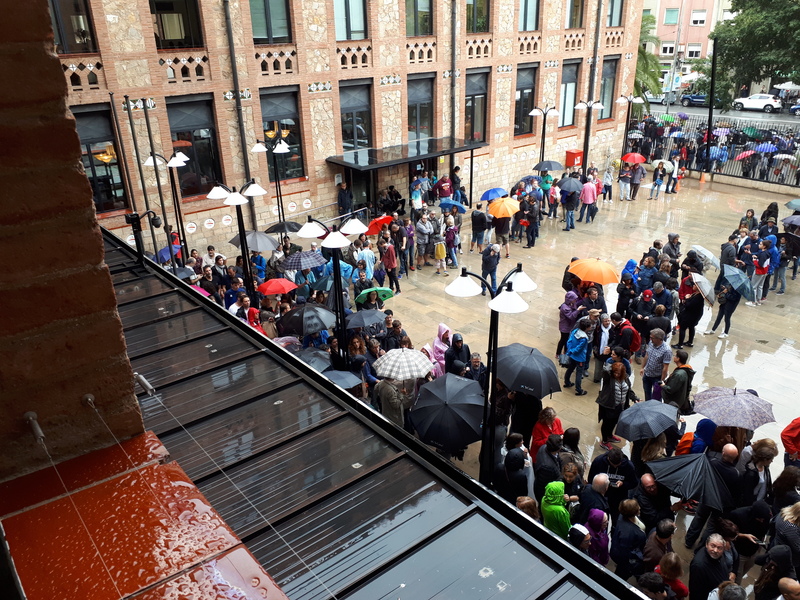 Photo of voters waiting to cast ballots by Carles Masats. English Canadian coverage of the referendum has been thin compared to what you find in Quebec. The majority of English Canadians might not like referendums and they may not be eager to endorse the secession of an autonomous region from a federal state. But local filters should not blind us from overlooking the importance of this referendum nor should Canadians accept the Spanish government’s labelling of this vote as “unconstitutional”. In early September, the Spanish Constitutional Court – at the behest of the government in Madrid – declared the whole exercise “illegal” because it violates Article 2 of the Spanish Constitution which proclaims “the indissoluble unity of the Spanish nation.” To put it another way, the Government of Spain and its legal institutions do not allow for separation or territorial losses. And of course they don’t. That is a fundamental premise of every nation-state in the world. Since the nineteenth century (and not before), an organizing principle of European countries has been to have citizens buy into the project about the natural and permanent logic of the nation-state. Over the past weeks and months, the Spanish government has taken a series of undemocratic actions, culminating in police violence which has injured almost 900 Spanish citizens on October 1 in an effort to prevent people from voting in the referendum and to confiscate ballots. Yet in addition to violence, the national government has shut down websites, prevented the post office from delivering certain political materials, and arrested people organizing the referendum. On September 29, Madrid even shut down the airspace over Barcelona to the media for four days. In the pursuit of defending the constitution, the Spanish national government has violated two other principles of that same constitution: democracy and the freedom of thought, ideas and expression. 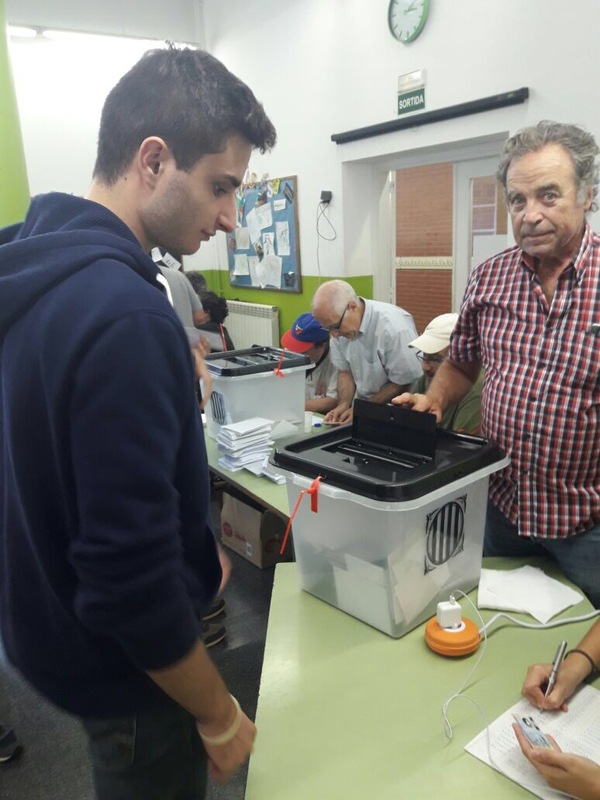 Organizing a referendum on October 1 may have been “illegal,” but by the same logic the Spanish government’s efforts to prevent that referendum from taking place were also illegal. The Spanish constitution – created in the ashes of a repressive dictatorship (1939-75) that had sought to eliminate the linguistic diversity of the country – has six distinct articles that guarantee a democratic system. Establishing democracy was a far greater preoccupation of the constitution’s authors and of the citizens who supported it in 1978 than the brief mention of the indissoluble unity of the Spanish nation. At the polls, photo by Jaume Casas Esteve. The Catalan independence movement has picked up steam since the 2008 financial crisis, but its origins are much deeper. The Catalan nationalism of the nineteenth century was compatible with Spain, but in the decades before the Civil War (1936-39), there was a growing interest in maintaining a distinct and separate culture in the region. Under the dictatorship of Francisco Franco, the Catalan, Basque, Galician languages were severely repressed. They were pushed out of schools, the legal system and government, and they were greatly marginalized in the media. This experience – still in the minds of most – is what is driving much of the desire to be a sovereign people. By the time of Franco’s death and when it came to make a new constitution, Spanish minorities such as Catalans sought to strike a balance between restored cultural autonomy and the still present desire in other parts of the country to push for a more culturally homogeneous society. In 1978, Catalans accepted the new constitution’s language about “the indissoluble unity of the Spanish nation,” in part to ensure the establishment of a democratic society. But it didn’t mean that they were happy about. To contest the Spanish vision of an united and indissoluble nation and to push for independence undermines the institutions of modern Spain, including its constitution. But that is the point of an independence movement. To use the defence of the constitution as the reason why a referendum can’t take place is a circular argument. It is useful for the Spanish central government, but the international community does not need to accept it. Benjamin Bryce is an assistant professor in the Department of History at the University of Northern British Columbia. He is the author of To Belong in Buenos Aires: Germans, Argentines, and the Rise of a Pluralist Society (Stanford, 2018) and co-editor of Making Citizens in Argentina (Pittsburgh, 2017).